One of my more enjoyable duties is to not only write this monthly blog on the eleven-year-old (EYO) Scouting program, but also to answer questions from time to time. Recently an EYO Scout leader asked if the EYO Scout leader could conduct the Scoutmaster conference as an assistant Scoutmaster and sign merit badge cards. The answer is yes. The Church of Jesus Christ of Latter-day Saints is chartered by National to operate somewhat differently than other Scout units. We do not have a Tiger program, boys are promoted to the next age-group programs on their birthdays, and EYO Scouts function as part of the Primary, not the Young Men organization. The EYO Scout leader is registered as the EYO Scout leader (an assistant Scoutmaster), but that is in part because there is only one registered Scoutmaster in a unit. The EYO Scout leader is the unit leader of Boy Scouting in the Primary. 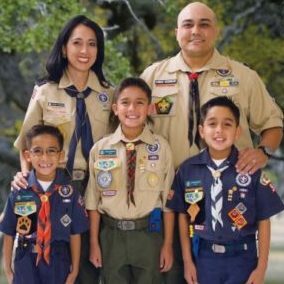 In LDS units, the Scoutmaster for the troop cannot adequately do the above unless he is attending a majority of the EYO Scout meetings and outings. The only individual who is in attendance most of the time is the EYO Scout leader (who happens to be an ASM). The Scoutmaster should be fully engaged with the Aaronic Priesthood and put his energies into that program. The above reference goes on to state that the Scoutmaster conference CAN be delegated and in some instances is best delegated. So categorically, there is no prohibition against the EYO Scout leader (ASM) conducting the Scoutmaster conference. To properly conduct a Scoutmaster conference, the adult leader should know the boy. The EYO Scout leader knows the boy, is working with his family, and is in the best position to conduct the conference. Because the EYO Scout leader knows the boy better, he is in a better position to effectively conduct the conference and tailor it to the individual boy. Reasons to have a Scoutmaster conference may include: a Scout’s lack of advancement, a perceived trouble between the Scout and others in the troop, a certain event at the last campout or troop meeting, and of course as part of the advancement requirement. The person who is in the best position to do this is the EYO Scout leader, not the Scoutmaster in the deacons program. 1. Work under the direction of a member of the Primary presidency and meet with her regularly to discuss the Scouting program and each boy’s progress. 2. Register with the BSA as the eleven-year-old Scout leader. 3. Attend the ward Scouting committee meetings. 4. Attend Scout training as applicable. 5. Attend other Primary meetings as invited. 6. Help each boy achieve the Faith in God Award and advance in Scouting. 7. See that the boys participate in a day camp, and help plan it if requested. I believe this re-enforces the fact that members of the Young Men organization have neither the authority nor the responsibility over the EYO Scout program and, by design, the EYO Scout leader (and his assistant, also an ASM) has both the responsibility and authority to conduct the Scoutmaster conference (as well as sign blue cards) and is in the best position to do so. One further note: Item 2 above (in the Scouting Handbook) indicates the adult registers as the eleven-year-old Scout leader (in the Adult Application he registers as the “leader of 11-year-old Scouts,” position code 10)—not as an ASM, although his assistant does register as an ASM. You will note that I address him as the EYO Scout leader as does the Scouting Handbook throughout (although the registration and responsibilities are those of an ASM). Nothing in the above, or elsewhere in the Scouting Handbook, extends a Scoutmaster’s responsibilities into the Primary. As we move forward in Scouting I hope we keep in mind the order of things as organized by the Lord and His servants. We do operate in some areas differently than as described in standard BSA literature, and understanding those differences is important. – Stan Stolpe has served in multiple Scouting positions at the unit, district, council, regional, and national levels in the U.S. and overseas. His current positions include district roundtable commissioner, district Cub Scout training chairman, and assistant Scoutmaster for a new Scout troop. He resides in Alexandria, Virginia, serving in the Mount Vernon Virginia Stake. The views and opinions expressed in this message are solely those of the author.